Splints boots are a necessity for horses used in performance events, such as barrel racing and cutting. Any rider, however, may choose to use splint boots for added protection when riding. After all, any step that prevents an injury to your horse’s delicate splint bones and tendons is worth the time and effort. For splint boots to work properly, you must choose the correct size and fit for your horse. The boot should cover your horse’s fetlock, or large joint over the front hoof, and cannon bone that reaches from the knee to the fetlock. According to the Equisearch website, when the boot fits properly it will not slide down, wrinkle or have any gaps. Measure the length and circumference of your horse’s cannon bone and fetlock before buying splint boots. Take the measurements with you to the tack store or use them when buying a pair online to ensure you get a pair that fits. When horses run and make quick movements, it is important to protect their front legs and splint bones that run on each side of the cannon bone. When used properly, splint boots protect the fetlock and cannon bone from nicks commonly caused by the back foot overreaching or the opposite leg bumping them. They also prevent scrapes or cuts often caused by debris and hold the tendons in place during stressful competition. Before applying the splint boots, groom your horses front legs. Brush away any dirt and debris and trim the long hair that grows around his fetlock to avoid irritation. Clean your boots with soap and water each time you take them off of your horse to remove bacteria. Also, regular cleaning removes grit and keeps boots smooth, which prevents chafing. Manufacturers often design boots in a set where one fits on each leg, so make sure you have the correct boot. Look for a "L" or "R" on the inside of the boot to help determine which is the correct leg. Put the boots on so that the straps are on the outside of the horse's leg and the tendon is pulled to the inside as directed by the Ultimate Horse Site. Kneel beside your horse’s front let, not in front of him since he can knee or stomp you. Cup the bottom of the boot that fits over the fetlock in your hand closest to his leg. Press the cupped area over the fetlock and secure the boot with the Velcro or snaps as directed by the manufacturer. Make sure all closures are tightened evenly. 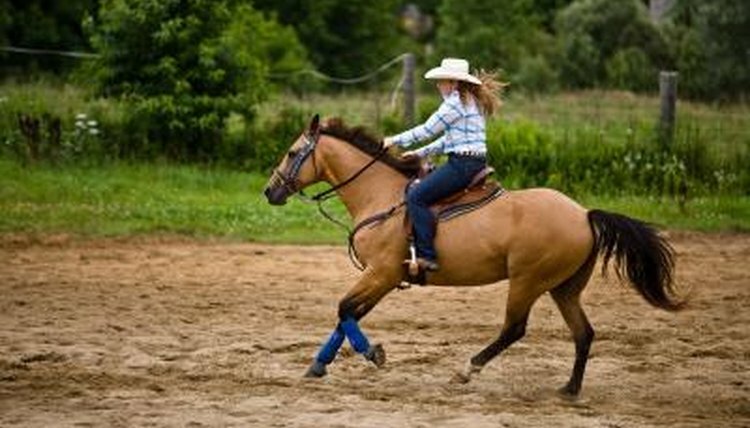 If one strap is too tight, the boot may rub a sore on your horse’s leg. Why Use Polo Wraps for Horses?